Teaches students Common Core Skills such as fractions and measurement with real-world representations. 155 wooden rods in 10 different colors. Each color represents a different rod length (1 cm – 10 cm). Enough rods for 4-6 students to use at a time. 5.0 out of 5 starsCuisenaire Rods: Excellent math materials for modeling numbers, number relationships, area, volume, word problems, & even music! 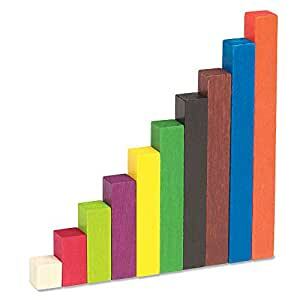 I highly recommend that you buy the wooden Cuisenaire rods. The precision of the lengths is better than the plastic ones. This particular set is beautifully made and comes in a clear plastic container. The assortment is a good one for multiple uses of the rods. I bought a second container for tutoring once I saw the quality. This basic set was later developed into the Dienes Blocks, also called base ten blocks, wherein the color pattern continues using the white one rod and the orange ten rod. I recommend buying base ten blocks that build on this color system to make understanding the relations among numbers more easy. If Cuisenaire rods are new to you, you are in for a treat. As a modeling tool for arithmetic, they are beyond compare. When using them to represent the numbers one to ten, children see and feel relative length and learn measurement in centimeters. Instead of the flawed flashcard method for memorizing facts, lining up the rods beside a meter stick shows the learner exactly what 5+3 or 3+5 looks like. For multiplication, the rods are extremely valuable for showing that eight yellow rods is not the same situation as five brown rods though they are the same total length (8x5=5x8). Beyond this, the rods can represent fractional parts and are useful for making models for area and volume. On YouTube there is a remarkable video of Gaetagno working with Montreal first graders in 1963 that begins to show how Cuisenaire rods can encourage high level thinking in very young children. The Miquon books are helpful resources for using these rods. For those of you who work with the Singapore block diagrams or the Math Playground Thinking Blocks activities, the Cuisenaire rods are invaluable aids for representing word problems. Music teachers can use the rods in measure groups to "annotate" simple rhythm patterns brilliantly. Strongest recommendation. 5.0 out of 5 starsBeware cheap imitations! This set contains 155 rods, which overlaps considerably with a full set of Cuisenaire rods, which has 241 rods. The manufacuring quality of the rods is consistent for each size and throughout the set. 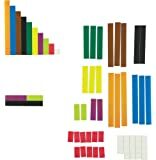 I would recommend buying a larger set of Cuisenaire rods--at least the full set of 241 rods--or two of these smaller sets (which might be cheaper, all in all), as the limitations of the small set become very ovious even when working with the rods by oneself with larger numbers or more rod-intensive configurations. I am a language teacher who is very interested in Gattegno's extension of Cuisenaire's invention of the colored rods for the teaching of mathematics and languages. I use Cuisenaire rods to create visual analogs of dialogues and sentence patterns so that my students can feel the difference between speaking word by word (which no one does in any language under normal circumstances, but they learn to do after having been conditioned with a grammar + vocabulary aproach to language learning) and instead phrase the words in intonational groups, much like musicians phrase notes and dancers phrase their steps. On a personal level, I also play around with the Cuisenaire rods to reteach myself basic mathematics, since I am one of the tens of millions of people who hit a wall in their study of math in elementary school. Reading Gattegno's books, I recall the mathematical terms used in class and the terror and confusion I felt as a kid who just wasn't getting it. I also intuitively recognize that, had I been taught visually and not verbally, I would have been much better at math and what Gattegno calls "mathematization." So I use the rods profesional for language teahcing and personally for my math re-education. Cuisenaire rods are great for getting comfortable with numbers. You can teach a surprising amount of math with them; my 4yo loves them. But a heads up. These smell toxic when you first open them. I don’t know what kind of paint they use on them but they need to offgas for a few days before they are usable. It’d also be nice to have some assurances from the manufacturer that they meet some basic ASTM non-toxicity standards. Other than that these are great. These are so valuable for giving young children a sense of numbers. 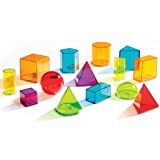 I used them with my daughter when she was three, playing the little games that I found in a book on the rods, and letting her color worksheets, and I use them with older students in my work to explain least common multiple for example.